Its Spring (!!!) and with it comes a lovely selection of fresh fruit, vegetable and herbs. Just like these beautiful ramps. Ramps are wild leeks, they look a lot like a scallion with a strong garlic flavor and have a very short season, about 3-4 weeks a year. I had to get some, not really knowing what to make with it. kumquats are delicious tiny citrus, that has a tangy and sweet flavor. Perhaps a chimichurri style sauce to accompany the lamb? 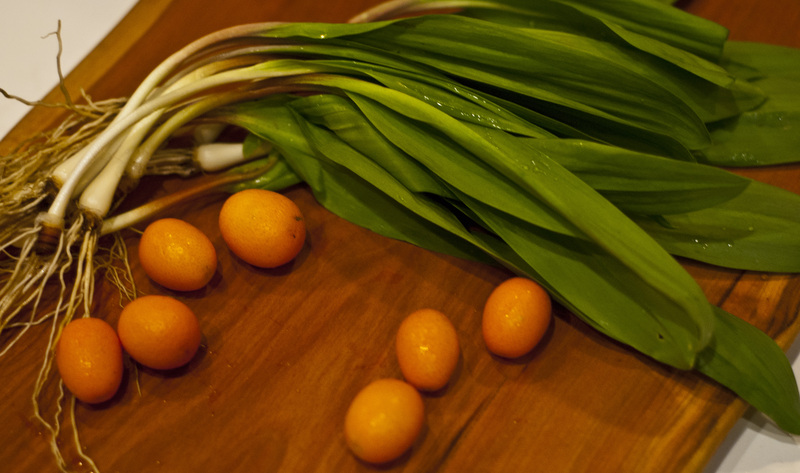 I Started by coring the Kumquats and dicing them small, then chopping up the ramps the same way, including the white bottoms. Add garlic, lemon and orange zest and a little of their juice, salt, pepper, chilli flakes and olive oil. I then made a critical mistake, trying to get the mixture to be finely chopped, I put it in the blender, that wouldn’t be so bad if I was holding back on the olive oil but I didn’t, and once I turned on the blender the oil emulsified, resulting in a creamy sauce rather than a chimichurri… it was still delicious, but had a completely different look and texture from what I was going for. It looked a lot like Guacamole.. but had a wonderful taste of a the green garlicky ramps, with a nice side kick from the kumquats. I came across this interesting looking fruit at the food co-op a few times before, and every time I picked it up and found myself puzzled from its appearance and the simple fact that it came with an instructions page. Last week I finally decided it was time to give it a try, so I took one home and placed it in a cup, bottom up, allowing it to do its thing. The monstera deliciosa is native to Mexico and Guatemala, and supposedly tastes like a combination of banana and pineapple. The fruit must ripen and peel itself, as it contain oxalic acid, so you place it in a cup or jar and just wait. A day or two went by and then one morning it happened, the scale looking skin cracked open, exposing a white flash and releasing an addicting tropical scent. This is the first time I have seen anything like this fruit, and I was fascinated by it. In the course of one day this little tropical monster peeled itself completely, exposing its white moist flesh and shedding, along with its green scales, hundreds of tiny black seeds. Once slices, it looked a lot like a cross between a corn and a kiwi with a very strong tropical odor. It was delicious, just as the name suggested, very sweet and very tropical, indeed a mix between a few more familiar flavors with a soft flesh. However after eating a few pieces from it, the mouth starts to tingle and you get that funny feeling that tells you not to over indulge. As the name suggested, once again, this is a monster we are talking about after all. About a year and a half ago, just a few days before I started working at The Breslin, I had dinner there with my father. Both of us ordered the bone marrow onion soup. neither of us was overly impressed and then he made a promise, that in due time he will teach me how to make what he was calling “real bone marrow”. The time has finally arrived, and for my farewell meal he shared with me his bone marrow roasting recipe. Bone marrow is something I was avoiding for years, for obvious reasons, I like to Believe. It’s fatty content always seemed unappealing to me. Then when I finally had some, I wished I have done so years earlier. When roasted correctly, bone marrow is the perfect companion for a nice slice of bread, scooped out and spread on a toast. finger licking worthy. Starting by pre-heating your oven to a medium-high heat, place the bones in a baking dish, marrow part up, and sprinkle some sea salt, freshly ground black pepper and paprika. place them in the oven for about 20 minutes, watching closely to ensure they aren’t going over and melting into oil. You know they are ready when the bone is nicely colored and the marrow looks like it starting to char. My father is an amazing cook, he’s been a culinary inspiration to me for years. His cooking skills always amazed me, he taught me some tricks that are the direct result of him being an inventor and is the only person who I allow alluring me into eating foods I wouldn’t dare considering. One of my favorite food games is asking him for one of his recipes. The ritual, is, with slight circumstantial changes, the same every time. It usually takes place over the dinner table, as I am wolfing on one of his delicious creations, I then, with a mouth full of food, ask him for the ingredients and he refuses to tell me what it is that was happening in his pots. then I ask again, and he, once more, says no. Then I give it a few minutes, just staring at him with anticipation. I can tell I’m getting close to breaking him down and so I ask once more. Usually that’s where he tells me what he did and how, unfortunately I can rarely duplicate it. Last weekend was a whole different story though. I came home to spend the weekend with my family and had the extreme pleasure of watching him in action. We are so far away from each other, that those moments are truly rare and fill me up with joy. He was slicing beef fillet to about a 1/4 inch thick slices, then in a mortar he made a paste from Rosemary, sea salt, pepper and olive oil. The meat was then rubbed with the paste and set aside. A heavy grilling pan was then wrapped in foil to avoid a ridiculously dirty stove top and the searing began. The meat goes in for a quick minute or two, on both sides and then comes out. Once all the meat is done he starts the sauce. 3 months ago, just as I returned home, my father made this very same dish, he asked that I’ll go get Moscato, and I did, only I got the bubbly version… He made it anyways, using the bubbly wine instead and that would have been it if it wasn’t for the next time he decided to make it, this time using the wine he initially planned on using, the sauce came out different, something was missing, those bubbles did something to the flavor that didn’t come through using the flat wine. Ha, what an incredible turn out to my little mistake! And so now I claim this recipe to be partially mine, and therefor can share it with the world. Back to the sauce now, on the same cast iron pan he used to sear the meat he now pours the wine, let it release all the flavors and adds butter, cream and lots of black pepper, if salt is needed it will be added a well. The meat goes back in for a quick second and then served.